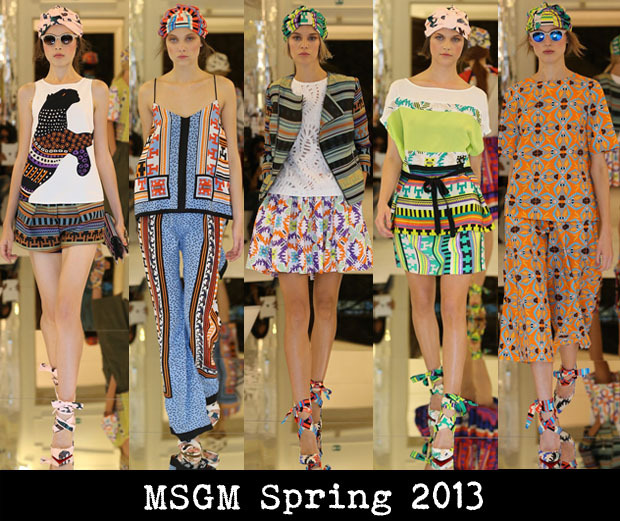 The MSGM Spring 2013 was one of my favourite presentations this Fashion Week. It encompassed all the things I love: colour, prints and affordability. Creative Director Massimo Giorgetti, who launched his brand just three years ago, presented an eclectic mix of ethnic patterns, exotic animal prints, mixed stripes and Navajo motifs. It may sound like a lot to focus on, but it was presented beautifully. If you were to buy four pieces from this collection you could mix and match them to give you enough different looks for a whole week. The pieces included skirts, shorts, tank tops, V-neck dresses, tunics, shirts, wide-leg pants and cropped jackets. Key accessories, which were just as colourful, included ankle-strap heels, turbans, clutches and mirror shades.